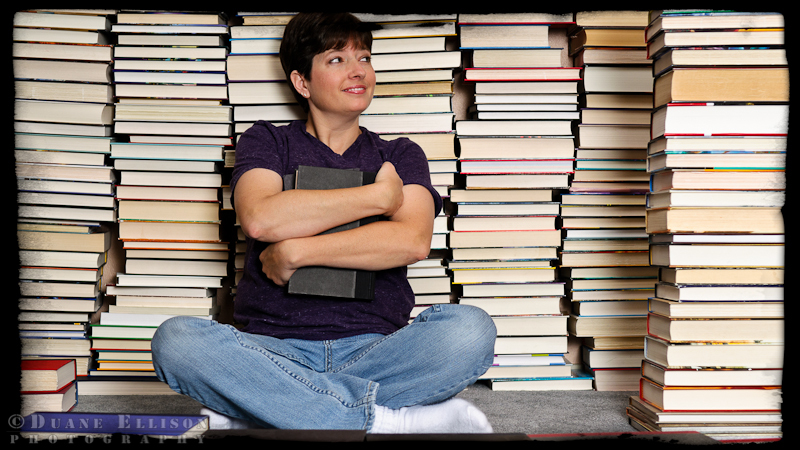 My wife Denise came up with the idea of using her large collection of hard bound books as the back drop for a photo shoot. She has always really enjoyed her books and she recently found some inspiration for an idea from a couple of sites on the net. So today we rearranged everything to make room for this shoot. As you can see from this image there are a lot of books needed to make this shot (and the many various we did today) a reality. The first part of the shoot was bringing the books need from the back room and removing most of the dust covers so they wouldn't end up in the shot. Then we spent a lot of time putting everything in the right place and taking a bunch of test shots to get everything just right! Once everything was in place we started shooting. The shot above was made toward the end of the session after we had done various situations with Devin and Deanna. The lighting of this shot was fairly straight forward. I placed a strobe high over head at a 45º angle increasing the distance from the subject to decrease the amount of light fall off. I then placed a fill strobe directly in line with the camera with a medium sized shoot through umbrella to balance everything out. I also shot tethered with Adobe Lightroom 3 which turned out to be critical to make sure everything was in the right place and lighted up correctly. It was a really fun shoot and I think we made some really cool images!